It’s time to bid farewell to the days of tripping over the ghastly guide ropes, injuring yourself with the bunsen burner and waking up to the sweet smell of condensation inside the tent, because ‘glamping’ is about to change your experience of camping forever. Whether you are planning a romantic vacation, a weekend trip away with your crew or a family adventure, we have selected some of the best glamping getaways, located in and around Sydney. Located in the Shoalhaven region at Greenwell, you wouldn’t be caught dead pitching yourself a tent or unrolling a sleeping bag at South Coast Retreat. Here’s your chance to get a glimpse of Africa (but without the air miles) by staying in the luxury of these safari-style tents. This glamping experience is perfectly tailored to suit those who have a taste for the exotic, with a Tasmanian Oak queen bed, together with warm alpaca blankets and twinkling fairy lights. Fully equipped with all kitchen appliances, a large modern bathroom and BBQ fire pit, this is an ideal home away from home when you just want to escape Sydney. At the forefront of ecotourism and glamping in Australia, Paperbark Camp, a family operated business, fuses together luxury tent accommodation and fine food and wine from The Gunyah Restaurant, within a peaceful bush setting. This hidden gem is tucked away near the sandy beaches of Jarvis Bay just 2.5 hours drive south of Sydney. Here, you can embrace a safari style camping experience amongst the beautiful eucalypts and towering paperbarks, and since it is situated right near the coast you can capture the sea breeze, which is perfect for all you nature lovers. 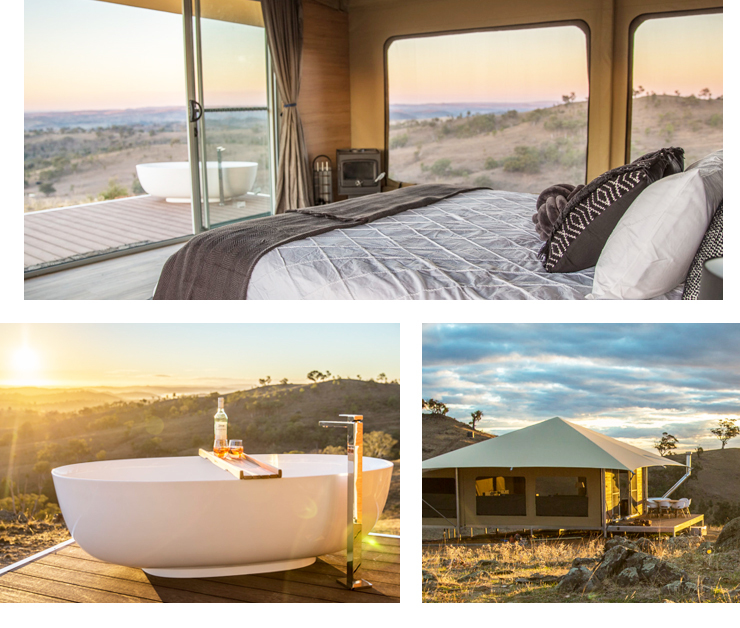 Shower in an open-air private ensuite while watching kangaroos, and be lulled into a peaceful sleep in a king deluxe bed sans the fear of the bed bugs biting. Truly escaping the hustle and bustle of the city, situated 3.5 hours south of Sydney is an award-winning glamping destination, The Escape, completely immersed in the Australian bush. Where else can you embrace 80 acres of land, together with over 2 kilometres expanse of the Clyde River? Exactly, there is nowhere else but The Escape. Relax and unwind by the tranquil riverfront and breathe in the sweet fresh air of Mother Nature, while sipping from your glass of wine – so idyllic. With the options of the luxury tents or a luxury studio (both fitted with modern bathrooms), you have the opportunity to embrace the traditional elements of camping, but without compromising on any sense of style, sophistication or comfort. 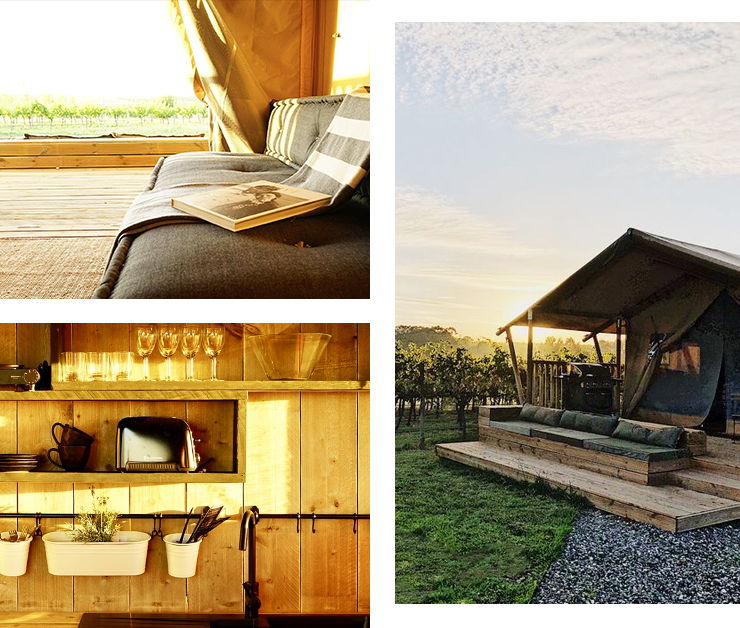 If you think glamping and drinking wine goes hand in hand (of course you do) then this one is for you, my friend. At Nashdale Lane, you’ll be glamping right there in the vines and to call this glamping is actually a huge understatement. Each “tent” is decked out with a verandah, kitchenette, couch and dining area plus there’s a BBQ area too so you can cook up your own dinner (there are also a whole host of local restaurants if you want to fully luxe it up). Ever fancied waking up to the sound of a lion’s roar or having a sleepover with a giraffe? I know this sounds like a bizarre dream inspired by jungle book, but this is a genuine must-do experience for both locals and visitors in the heart of Sydney! You can get up close and personal with the exotic Taronga Zoo animals (don’t worry they won’t bite), as you relax in award-winning tents, situated perfectly with the spectacular views of the Sydney Opera House and the Harbour Bridge. This once in a lifetime experience includes an all-you-can-eat buffet dinner, an exclusive night safari and two fabulous behind the scene tours of the zoo. Go on, we know you want to get in touch with your wild side. Roar. Situated 10km north of Sydney’s CBD at Lane Cove River Tourist Park, you will be surrounded by an abundance of flourishing gardens and the serenity of the natural world. The Tandara offers a fabulous and luxurious alternative to the conventional way of camping, incorporating sustainable initiatives and eco-friendly principles. Who knew that you could simultaneously enjoy the picturesque views of the national park, while also relaxing in your safari-inspired tent that has its very own private ensuite, plasma screen TV and outdoor, deluxe kitchen. You really can get the best of both worlds. This cave rental experience allows you to travel back in time a few millions of years and live life as a caveman (or woman). Yes, we know this is not your typical camping trip with a tent, but we think this is pretty awesome. The Enchanted Cave is built on a natural rock platform, which overlooks the world heritage national park. Not dissimilar to an adventure to the Middle-Earth, you will discover a realm like no other. The intimate space of the cave accommodates two people, which is perfect for that romantic weekend away that you have been meaning to book. Don’t fret – being a Neanderthal is not a requirement. Relax by the cosy fireplace, indulge in the outdoor spa and hatch a plan on how to stay here forever. If wine, relaxation and 110 hectares of rolling hills is your glamping cup of tea, hold on to your hats because Sierra Escape has something in store for you. Located just 20 minutes outside of Mudgee and home to all your fave Aussie wildlife (kangaroos anyone?) this is the perfect location to take in a sunset after a day of winery hopping. You could barely call them tents, but the humble abodes include everything from king beds to wood fireplaces, baths and even a private deck. Not to mention these are fully eco tents, so live it up in nature knowing that you aren’t even leaving a footprint! Cockatoo Island, the largest island in Sydney Harbour, is a haven in itself. Choose between one or two bedroom glamping options for 2-4 people, then sit back and relax, that’s the only hard work you’ll be doing. No glamping experience would be complete without some added luxury, so enjoy your complimentary toiletries from Appelles Apothecary before falling asleep to the sounds of the harbour. Take the scenic route down the South Coast of NSW to Coolendel’s uber luxe glamping retreat. While they’re fully stocked with everything you’d want for a romantic trip or gals weekend away, this glamping experience is all about connecting with nature. So much so that reception drops out 20 mins before arriving at the site. This is THE place for anything and everything outdoorsy, so BYO bikes, canoes, fishing rods…and marshmallows (you can’t go camping and NOT roast these bad boys!). Simple Pleasure’s pop-up glamping experiences have parked themselves at Mayfield Garden which is essentially the Versailles gardens of NSW (so bloody gorgeous). Not only does the package include tents decked out with rugs, Hugo Sleep mattresses and top quality linens, but you’ll be feasting on a dinner for two, with the majority of ingredients from none other than Mayfield Garden itself. After dinner, you’ll relax by the fire pit and play a couple of games, or head up to the Obelisk Pond (exclusively open for glampers because you’re THAT important) for stargazing. Hidden amongst bushland an hour in from Byron Bay, Silk Pavilions turns up the luxe and comfort factor of regular camping. With options of either standard or deluxe glamping, all tents include ensuite bathrooms, queen beds and private decks. Yes, this is really the only way to escape to nature. You’ll be sharing the 100 acres of land with a whole bunch of native wildlife too—think wallabies, geckos, echidnas and lizards, plus with a creek filled with lily pads, ducks and frogs. You’ll have a lot of exploring to do. And after all that exploring, you’ll be hungry (of course! ), but with an onsite restaurant and breakfast included, Silk Pav has got you covered!